Here comes a small simple scenery, I made on request for somebody, of the Coronel Olmedo Airport (SACD) in Argentina. It is the airport of the "Aeroclub Cordoba". All pictures for the textures are taken from the Internet, I have never been there by myself and I also have no connections to that airport and it's people. The default scenery of FS2004 only shows a simple grass runway here with no buildings or taxiways at all. 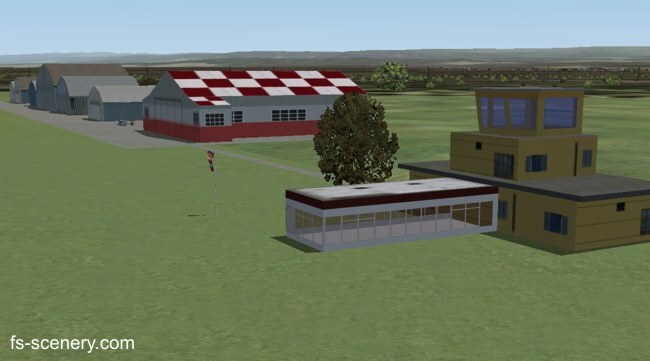 Now we have most of the hangars with it's original front view and some others run on the default textures of FS2004 because there were no pictures to find. In the end, when the scenery was almost done I planted some trees around the airport, only to find out, that the trees were showing the wrong textures for the seasons. So I deleted them again and the scenery now comes without any trees.